The Presidential spokesperson announces earlier that destabilization is real. There’s a plot to oust President Rodrigo Du30. Manila Times Managing Editor Felipe Salvosa II tenders his resignation. Salvosa opposes the publication that there’s a plot to unseat the President. It is written by Manila Times chairman emeritus and columnist Dante Ang. Salvosa does not want to upset his friends at the Philippine Center for Investigative Journalism, Vera Files, Rappler, and the National Union of People’s Lawyers, Salvosa said. 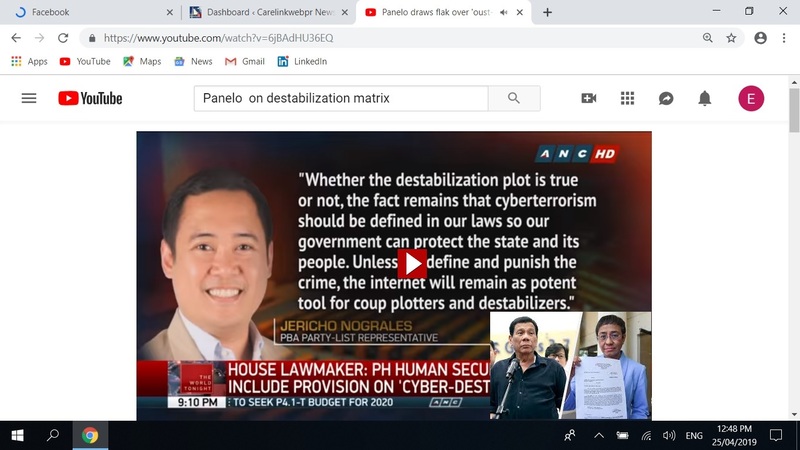 [VIDEO]: Panelo draws flak over ‘oust-Duterte matrix’. The opposition rejoices. It is a relief for personalities that the Malacañang implicates in an alleged plot. These people now challenge Du30 to reveal the source of his information. However, the editor does not have the evidence of the writer. His mere duty is to edit the the article. Investigative journalists can secure the facts but this normally happens before an article is written. It’s not the editor’s call especially when the Chairman writes it. Salvosa, the coordinator of the Journalism program at the University of Santo Tomas, added that Manila Times also asks him to step down because of his strongly-worded social media posts that questions the accuracy of Manila Times’ report. If the publications owner writes about a story that he knows more than anyone else, an employee who questions it online can only trigger friction. That’s purely an act of disrespect or insubordination. In his own words, the editor said; “A diagram is by no means an evidence of ‘destabilization.’It is a very huge stretch for anyone to accuse PCIJ, Vera Files and Rappler. The are not actively plotting to unseat the President. I know people there and they are not coup plotters.” He wrote this on his private Twitter page. This is clearly an assumption and not logical. The article of Ang has the strong backing of Malacañang. Ang also serves as Du30’s special envoy for international public relations. He surely has the insider’s information. Presidential spokesperson Salvador Panelo said the matrix is the result of an intelligence information. A foreign country got these from phone conversations. The matrix has the validation, according to Panelo. However, gov’t forces said there is no clear evidence that links the journalists to any ouster plot. Therefore, their actions can speak for themselves. The presidential daughter and Davao City Mayor Sara Du30-Carpio denounces Leni Robredo’s statement of loyalty. Robredo refers to the alleged truthfulness on Imee Marcos’ educational credentials. The mayor reminds the presumptive VP that she should know how the public addresses her as a fake vice president. Robredo sticks to her statement after the mayor’s insult. She also laughs at Mayor Sara’s warning to forget her ambition to be president because she has no intention to. In fact, if a Marcos runs for President, it’s Kris Aquino who would likely take up the challenge. 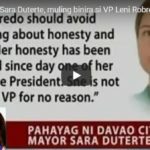 [VIDEO]: Davao City Mayor Sara Duterte, muling binira si VP Leni Robredo. The mother of Mayor Sara speaks to her daughter on the subject. She said that everybody knows that she’s the child of the tough-talking President. However, she’s also the daughter of her mother, Elizabeth who is soft-spoken. Better not to retaliate to any answers from the Camp of Robredo where she said that the temporary VP is hiding. In respect to the advice, the mayor declares a ceasefire. On the other hand, many people are hoping that the former First Lady, Imelda Marcos’ dream for her son, Bongbong would finally come true. That is to become the President of the Philippines like his father. President Du30 swears on resigning from his post to give way to Marcos. Robredo said clearly that she does not want to be president but if something happens to the president, it is her mandate to take over like any other VP. Unfortunately, she is known as the most unpopular VP Philippines has ever known. Some organizations even refrain from calling her VP. For them, Bongbong Marcos is the real winner of the VP race in 2016. His electoral protest against her that highlights digital fraud is now awaiting the Supreme Court’s decision. Former President Noynoy Aquino’s sister, Kris said in an interview that she won’t run against the Presidential daughter for the top executive post. There’s only one thing that would make her do so. That is to oppose any Marcos from gaining back the Presidency. This pronouncement is identical to her brother’s promise prior to the 2016 elections that he would do everything in his power to block Bongbong Marcos from the VP post. Bongbong Marcos vs. Kris Aquino in 2022? The Marcos-Aquino rivalry seems to continue. This started when the Aquino patriarch, Ninoy Aquino was rejected by Imelda Romualdez, a beauty queen who became the First Lady of the late President Ferdinand Marcos. Now, the namesake is likely to face the daughter of his father’s greatest rival. This time, Ms. Aquino should know that the yellow or Dilawan name popularized by her mother, the late President Cory Aquino does not appeal to the majority of Filipinos anymore. It would definitely be a tough move for her. HNP or Hugpong ng Pagbabago endorses its own slate of senatorial candidates for the May 13 elections. Eight of them are in the list of likely winners, even according to Pulse Asia’s March survey. It gets most of its popularity from Inday Sara. She is the founder of the party along with other Davao regional leaders. One thing is certain that the group never has an anti-Marcos bet. This marks the end of former President Noynoy Aquino’s influence. [VIDEO]: Hindi pa ganap na nasisiyahan si Mayor Sara Duterte-Carpio sa resulta ng pinakabagong Pulse Asia survey. The selection of many politicians for HNP is largely dependent to the Presidential daughter. This is one reason why some HNP members are thinking of making the party a national one, instead of just regional. The opposition also thinks that Sara’s endorsement of senatorial bets, through HNP, is her way of testing the waters for a presidential candidacy in 2022. However, it is evident that she mainly endorses Imee Marcos, the sister of Bongbong Marcos whom her father wants to be President after him. It might sound like a joke to many but the mayor’s humor on running as Vice President in 2022 actually makes sense. If her family supports the namesake of the late President, Ferdinand Marcos as President Rodrigo Du30’s successor, then she can very well be his VP. Re-electionist Cynthia Villar, and Pia Cayetano plus new-comer Imee Marcos are always in the top 12 according to poll surveys. Bong Go, and Bato are also strong contenders as endorsed by the President himself. Sonny Angara, JV Ejercito, and Bong Revilla might follow suit. Atty. Glenn Chong who is fighting bravely for clean election as backed by another senatorial candidate, IT expert, Toti Casino. They are doing well in the initial absentee voting among the overseas Filipino workers in Hong Kong, Singapore, the UK and the Middle East. They campaign hand in hand with Gov. Marcos. Another quiet supporter of the tandem whom the Marcoses are grateful of is Senator Nancy Binay contrary to the belief of others. Her election resolution allows the Senate Hearing on the poll fraud in 2016 that benefits Marcos’ electoral protest. Tolentino, Manicad, and Mangundadatu may not be as popular as the other bets but they share the same principles as the Marcos-Du30 tandem. Mayor Sara said that she might decide in 2021 to run for national elections. Actions speak louder than words they say. Therefore, the Marcos-Du30 slate may emerge while the Aquino influence is fading. Atty. 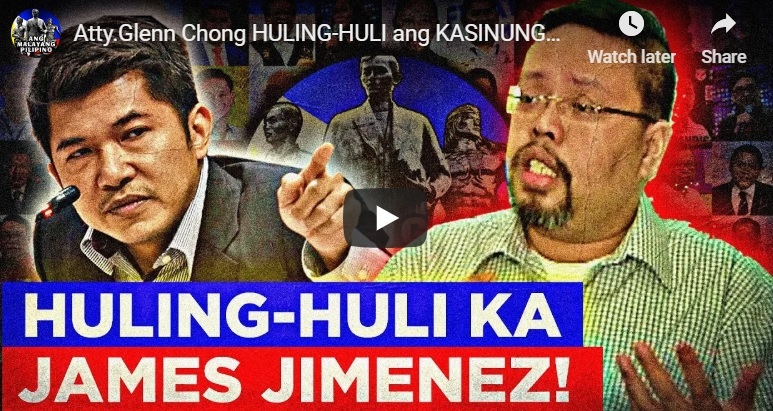 Glenn Chong, cannot believe Comelec spokesperson, James Jimenez’ disclosure. He said that the Commission on Elections prepares for the possible deluge of fake news. Jimenez made this known now that the month-long overseas voting is ongoing. There are various reports of irregularities from volunteers who are Filipino overseas contract workers. Hong Kong, Singapore, United Kingdom and the UAE have some initial reports that challenged the integrity of the 2016 election as per Bongbong Marcos’ VP electoral protest first course of action that was set aside by the Supreme Court. He cited what happened in the 2016 overseas voting when a voter made claims that what was printed in his voter receipt were not the ones he voted for. “The person who complained used a ballpen in voting for a particular position and then used marker for the other. When the voter receipt came out, the vote marked with ballpen obviously was not read by the vote counting machine,” said Jimenez. Atty. Chong challenges Jimenez to demonstrate in public if the VCM rejects the one with the ballpen shades. Attack on the Election System Integrity? Jimenez added: “That video was uploaded within the first day. That basically set the tone for the attack on the integrity of the election system.” This is a rather defensive comment of Jimenez. Is he protecting the reputation of the Smartmatic machines? According to Chong’s IT experts, the device is already obsolete. There’s also no doubt that cheating is possible using them as per the testimonies of other countries that have used them. 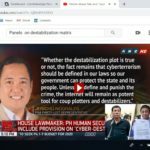 Jimenez said that another strategy to discredit the automated system in the previous polls was the spread of information that voting was already done and counted. That this and that candidate already won. 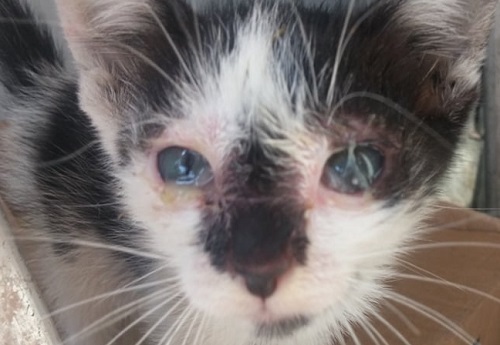 “That is what we are watching out for,” he said. Perhaps, the Comelec spokesperson meant that the results were already transmitted to the main server from some VCMs prior to the election day which is a fact. Jimenez said they were appealing to the public to inform the agency if they see or hear such form of fake news so that it can correct it. 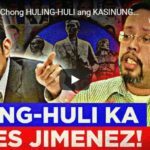 “We call on the public to forward to us any such news or information that they would encounter to the Comelec so that we can quickly find the truth and correct such claims,” he stated. On the other hand, Chong also calls on all voters to always check their receipts if the candidates they voted for are printed there. Then to report any discrepancy at once. 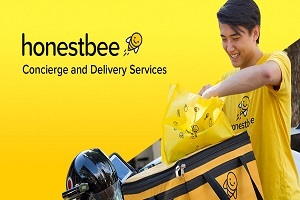 Overseas voting starts from April 13 and ends on May 13. The clean election advocates have at least a month to record the trends of anomalous processes. The idea is to have all complaints be properly recorded. Should these irregularities become massive, such records can be the basis for failure of election protest. Observing the exchanges involving unsatisfied ofws, it seems that Marcos was right after all. Bongbong Marcos’ Easter message revolves around hope, new beginnings and renewed life. He wishes for fresh inspiration, dedication for hard work, and fighting spirit to finally strive for a better living. The last 3 years was quite a challenge for the family but never do they panic as the electoral protest for the VP post is close to the end. They know that the best is yet to come after the holidays. [VIDEO]: From our family to yours . . . wishing you a joyful Easter! After more than 1000 days of the electoral protest, some Marcos loyalists went to the Supreme Court to protest the slow progression of the decision. The Comelec said that the recount is close to completion. The PET will then decide if the result of the recount in Marcos’ pilot provinces is substantial enough to continue the process to the rest of the protested precincts. Marcos asks for his supporters’ patience in a video interview. In anticipation for good results after Easter, Marcos already submitted a plea to resume the technical examination of the voting ballots in the ARMM region. This is after Comelec itself found that 80% of the voters there were fake. In the midst of various reports of irregularities during the ongoing absentee voting abroad particularly in Singapore and Hong Kong, Imee and Bongbong Marcos do not have to do anything. Atty. Glenn Chong and his volunteers would not allow any anomalies without being reported. In Contrasts to the chaos in the Middle East, UK, Hong Kong and Singapore, the absentee voting in the US seems normal. America has always been anti-Marcos. Now, it’s the Du30 administration that disregard them in favor of China. Many Filipino-Americans also support the Liberal Party. However, the Marcoses are very diplomatic in their dealings with them. Struggle is not necessary when it is one’s destiny. Marcos knew that from the start as per his coolness. Patience is indeed a virtue. So, if the highly mistreated future Vice President can afford to relax during the holy week and emerges fresh during Easter, the loyalist must learn to trust what is in store for him and the country through the divine providence.